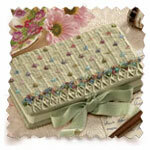 Description: Create a perfect gift for someone you love with this elegant journal cover. Stitched onto celery silk dupion, the cover features an unique linear smocking design, heavily encrusted with glass beads. Beaded flowers in shades of amethyst, sapphire, rose, aquamarine and champagne are dotted along the horizontal pleats, culminating in a rich, floral band at the edge. The cover ties with matching celery ribbons.